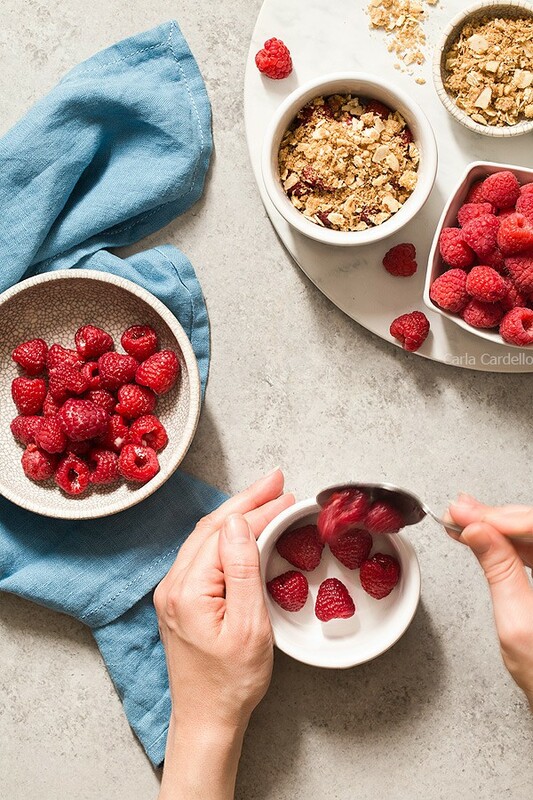 Enjoy a sweet ending to your day with mini Raspberry Almond Crisp For Two with a sweet and slightly tart raspberry filling topped with a crispy almond streusel baked in two ramekins. Awhile back I asked you on Facebook what recipes you’d like to see coming up. I kept seeing “dessert for two”, so that got my wheels turning. What haven’t I made yet you’d enjoy for summer? With Memorial Day and the unofficial start of summer next week (!!! ), it’s only fitting to start sharing some berry recipes. Everyone seems to love fresh fruit desserts in the summer, whether it’s peach cobbler or strawberry ice cream. As I was going through my recipe list, I realized I didn’t have many raspberry recipes. Then it hit me – fruit crisp! I’ve made plenty of cobblers, dumplings, and even a crumble, but only one crisp. Plenty of apples, peaches, and strawberries, but hardly any raspberries. 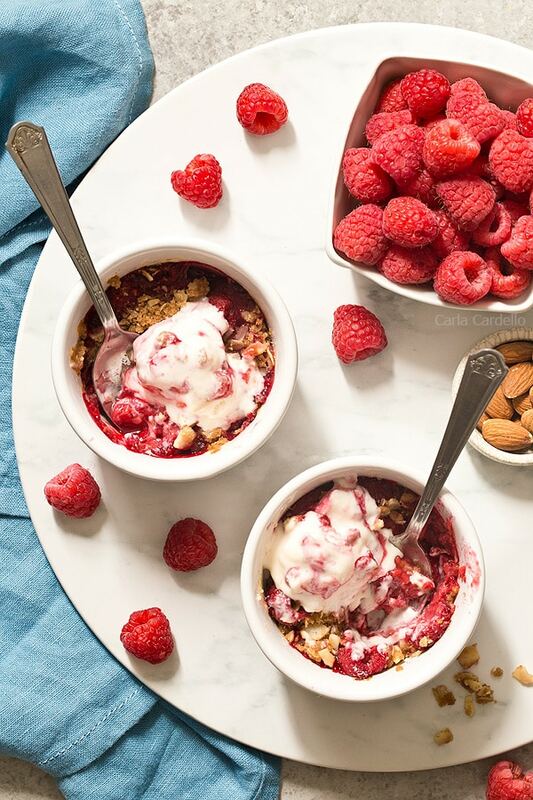 And that’s how my Raspberry Almond Crisp For Two was born with a sweet and slightly tart raspberry filling topped with a crispy almond streusel baked in two ramekins. Topped with ice cream, they are the ideal sweet treat to end your meal. The difference between a crisp and crumble is the oats. Think of the oats giving the topping a crispy texture, hence the name crisp. I also added almonds for extra crunch. To bring out the almond flavor even more, I added almond extract to complement the raspberries. As fun as baking is, it’s no secret it can be a bit pricey with the ingredients – butter, flour, sugar, eggs, the list goes on. That’s why I shop at ALDI because their low prices make baking more affordable; they believe you should never have to over-spend to enjoy quality food. Take these raspberry crisps for example. Buying the ingredients at Walmart with their private label brand came to $32.99. Buying the same ingredients at ALDI came to $29.19. Buying national brands would make the savings difference even more. 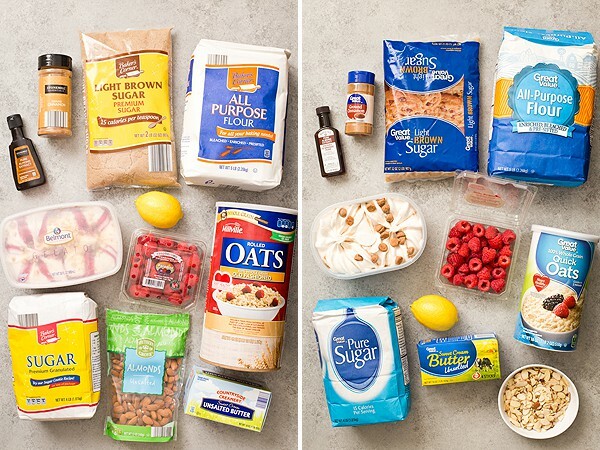 Considering this is for one recipe, imagine all of the desserts you could bake with the above ingredients and the savings for an entire week of groceries. 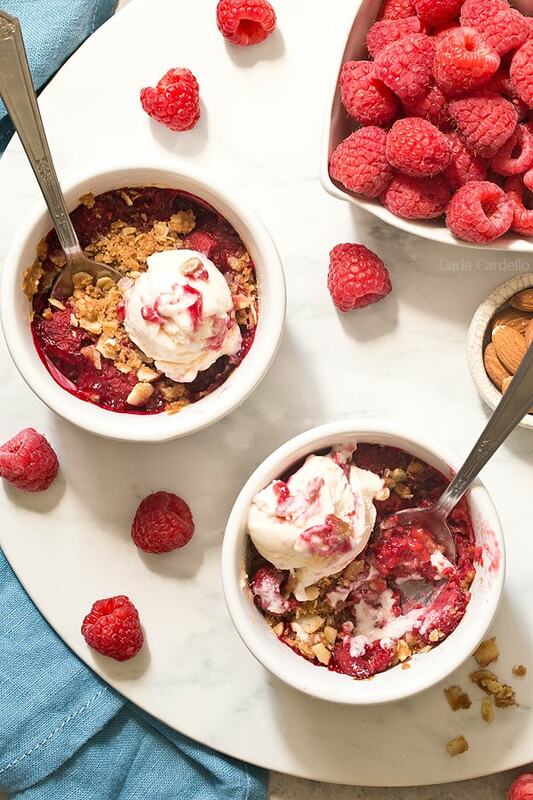 Of course no raspberry crisp is complete without ice cream on top! I paired them with raspberry cheesecake gelato because of the raspberry swirl, but feel free to use your favorite flavor. Preheat oven to 350F. Have two 6-ounce ramekins ready. 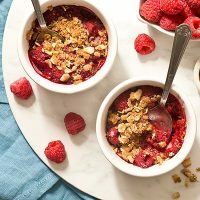 In a large bowl, gently mix together the raspberries, sugar, cornstarch, lemon juice, and almond extract. In another bowl, mix together the brown sugar, flour, oats, almonds, and cinnamon. Using a pastry blender or two knives, cut in the cold butter until the mixture resembles small pebbles. Divide the raspberry mixture between the two ramekins. Top with crisp topping. 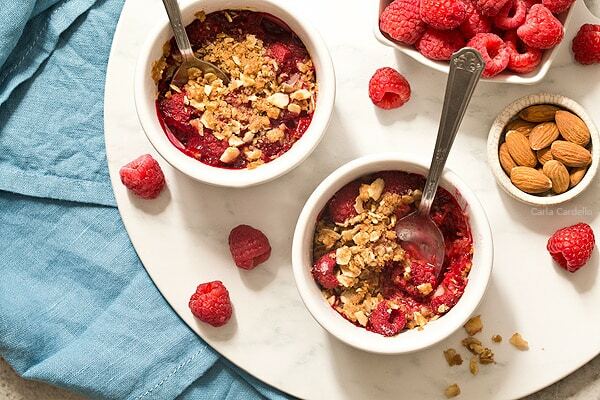 Bake for 30-35 minutes or until the raspberries are bubbly and the topping is golden brown. Cool for 15 minutes then serve warm or at room temperature with gelato. Disclosure: This post is sponsored by ALDI. As always, thank you for reading and supporting brands I work with, which helps keep Chocolate Moosey running. Made this last night for 4; doubled th eingredients and baked in a single dish. Yum! I used a mix of blueberries, raspberries, and blackberries. Because it was not too sweet, the fruit flavors came through. Happy to hear doubling the recipe worked out for you! Loved you used mixed berries. Love Aldi. Picked up berries while doing Memorial Day shopping. Very good. Isn’t ALDI the best? Thanks for sharing your feedback! Thanks, Julia! Please let me know if you try it.